My late mother, who died in 1995 aged 75, was an aspiring writer. Although, like many of her generation, she had been unable to complete her formal education, she had continued to educate herself about history, politics and world affairs by devouring newspaper articles and any other information she could get her hands on. 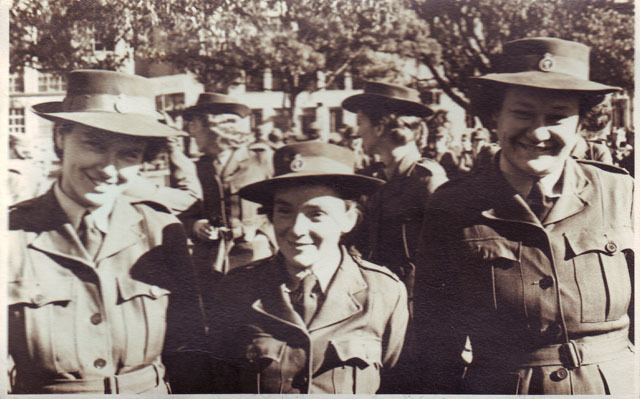 I recently I came across a major article that she had kept from 'Truth', dated April 2nd, 1939 which was entitled: "Defence and Employment must go hand in hand". She had written many articles herself, analysing the situation and explaining her reasoning and intuition about the forthcoming war. These are also in the archives, although none were published because, she often told us, the editor felt that but printing such articles might create public panic and cross delicate diplomatic negotiations. Today, such writings would be placed on a Blog on the Internet; or on Twitter, and all could discuss and argue the points she would have made â€“ or agree with her. The article that was published, that my mother kept, itself is interesting and these 71 years later deserves some closer inspection. 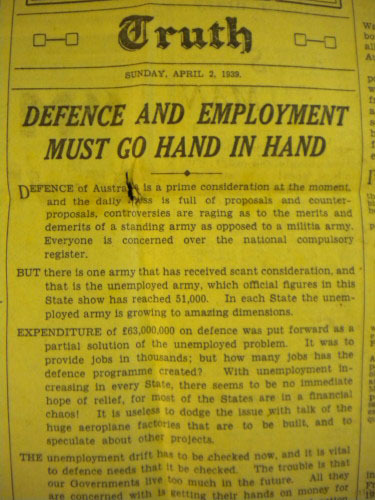 It reads: "Defence of Australia is a prime consideration at the moment, and the daily news is full of proposals and counter-proposals, controversies are raging as to the merits and demerits of a standing army as opposed to a militia army. Everyone is concerned over the national compulsory register. "But there is one army that has received scant consideration, that is the unemployed army which official figures in this State show has reached 51,000. In each State the unemployed army is growing to amazing dimensions. "Expenditure of 63 million pounds on defence was put forward as a partial solution to the unemployed situation. It was to provide jobs in thousands; but how many jobs has the defence programme created? â€¦.."
The Great Depression has an historical 1929-1934 period but throughout the western world the after effects were still being counted in such areas as unemployment. The military and build up of armaments were two means that could increase employment, it was thought, as many people surmised that war was coming. This article reflects this consideration. Theologians have long discussed the subject of a 'Just War' in a Biblical climate from Old Testament where the Israelites were instructed to engage in war to ensure the theocracy was in no way impacted by foreign religions. And from the New Testament where for example, Jesus never condemned the Centurion for his occupation and himself spoke of wars and rumours of wars as a forerunner to His return. 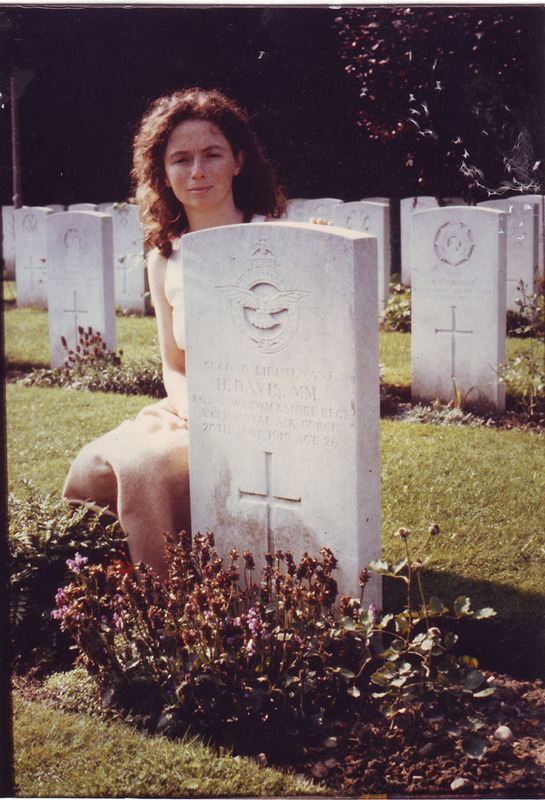 Photo - My sister Susette beside the grave of our maternal grand father – 1914-18 War Grave.